Over the course of my short but colourful life I have, on my occasional off duty periods, been partial to an evening in with friends -a glass of wine and a bonding yet thrilling history board game. Over the years I have amassed a not un-impressive collection, I would not consider myself a connoisseur but I have certainly come across many that I have greatly enjoyed, some I could take or leave and some I would certainly never play again. 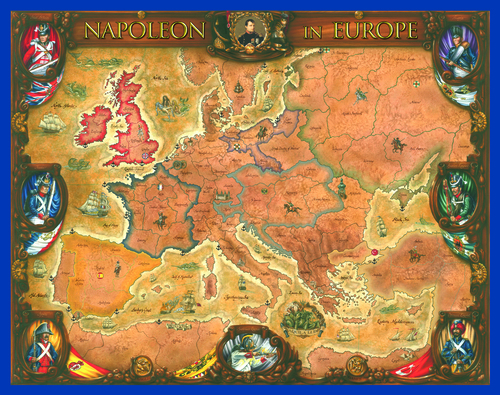 Here are five of my favourite history board games that I would recommend to any student, aficionado or occasional dabbler in modern history. 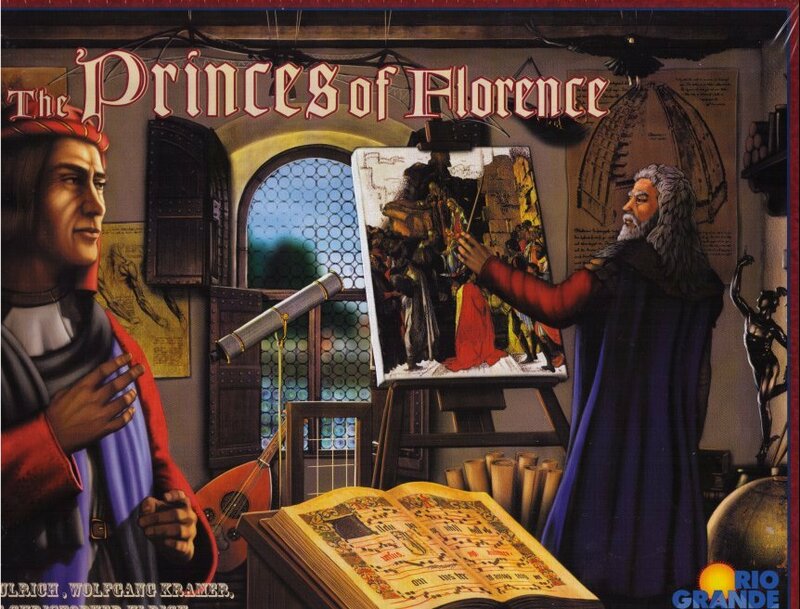 In Princes of Florence, you -on your kitchen table can experience the golden age of the Renaissance. 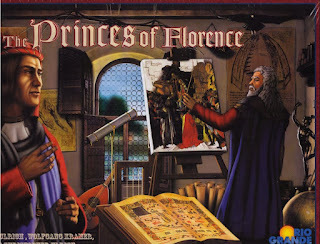 Assume the role of the head of an Italian Aristocratic dynasty and lead your family like the Medici or Borgia! Players assume the roles of Florentine Princes who wish to design their own villas to allow artists to create great works of prestige. Through seven rounds, each containing an auction phase and two action phases, the Princes pay for landscaping, buildings, freedoms, and various services and bonuses. At the end of the seven rounds, whoever has the most Prestige Points wins. An interesting strategic element is that whenever new buildings are placed in the player's villa, they may not touch other buildings, unless certain conditions are achieved first. This leads to not always being able to purchase the most advantageous buildings if they be fitted into the playing area. This board game is designed to transport you back hundreds of years to medieval Japan. The Emperor is aging and his family is weakened. Each player takes the role of a Daimyo trying to gain total control. Only one will get the supreme title, but no one can succeed alone Alliances will be forged and with betrayals for the final crowning of the Shogun! To achieve your goals and to gain honour, you will have to overcome your adversaries in terrifying bloody battles, by holding in respect the other clans grace, honouring hostages or alliances. Diplomatic Phase, where you will be able to exchange military advantages (which make it possible to decrease the randomness of the engagements), to trade and acquire hostages (thanks to whom you will be able to pressure your adversaries at the time of the engagements). Order Phase, where you will place orders on the territories which you occupy. There are three types of orders: movement, production and raising troops. Action Phase, where the honour is of utmost importance. The player with the most honour hosts the Emperor. And that enables him to choose in which order the territories and corresponding orders will be processed. You may well imagine, that combats are frequent. One player then rolls 9 dice (whose faces are decorated with the symbols of each clan) whose results are then modified by the bonus acquired during the diplomatic phase. Only the attacker (and only when victorious obviously) can acquire Prestige (points of honour) due to the engagements. This honour is proportional to the troops vanquished at the time of the conflict. The more deaths there are, the more honour there is! All elections are turning points, but the presidential election of 1960 holds a special place in American history. The 1950s had been a period of unparalleled economic growth and US global power. Richard Nixon served as President Eisenhower's Vice President through most of the period. Nixon's humble origins gave him a common touch that appealed to the small town, idyllic America encompassed by the spirit of the 1950s. John F. Kennedy, was Nixon's mirror image: charming, Harvard educated and the scion of an American political dynasty. Kennedy challenged Americans to confront the uncertainties and tumult that were already emerging in 1960. He set his vision not in the past, but on new frontiers. In 1960: The Making of the President, you take on the role of one of these great protagonists vying to lead America through an era of turbulent change. The candidates must contend with all the great issues of the day, from the Cold War to civil rights to voters' pocket books. This is an election that will turn on positioning and momentum. The contest is fought on an electoral map of the United States as it stood in 1960. Using a card-driven game system, all the major events which shaped the campaign are represented: Nixon's lazy shave, President Eisenhower's late endorsement, and the 'Catholic question' are all specific event cards. The famous televised debates are also an important component of game play. As with a real election campaign, the challenge is to adapt your game plan as the ground shifts out from under you. There are never enough resources or time to do everything, but you need to make the tough calls to propel yourself into the White House. 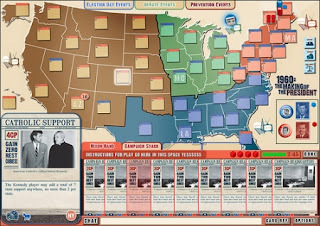 This fast-playing strategy game for two players challenges you to relive the most significant political contest of the Twentieth Century. Will you recreate history, or rewrite it? 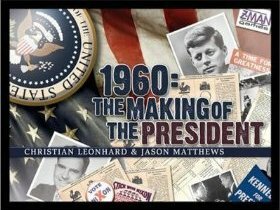 1960: The Making of the President provides you the opportunity to do both. A sweeping conflict in the South Pacific where naval might leads to air superiority. 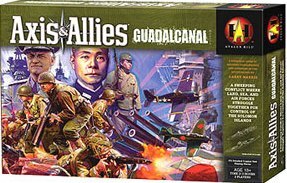 Axis and Allies: Guadalcanal challenges you to control sea zones and island groups while managing troop and supply transport and directing land, sea, and air forces in one of the decisive campaigns of the Second World War's Pacific Theatre. Axis & Allies is not a strict historical war-game, due to its streamlining for ease of play and balancing so that both sides have a chance to win. 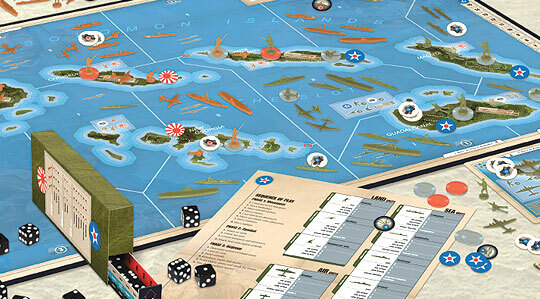 Each round of a game involves each of the powers moving in turn according to a specified order; the game ends when either the Axis powers or the Allied powers complete their objectives. When each power takes its turn, they must first declare how they are to spend the IPCs ("Industrial Production Certificates", an abstract currency representing one million man-hours of labor) in their possession: this may go into buying new units, improving units through research (in earlier editions), or repairing damaged structures (in later editions). 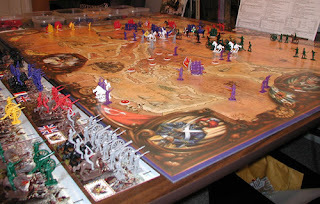 Players then declare any movements made that would result in combat, moving their pieces as appropriate, and after resolving combat, declaring any non-combat movements. 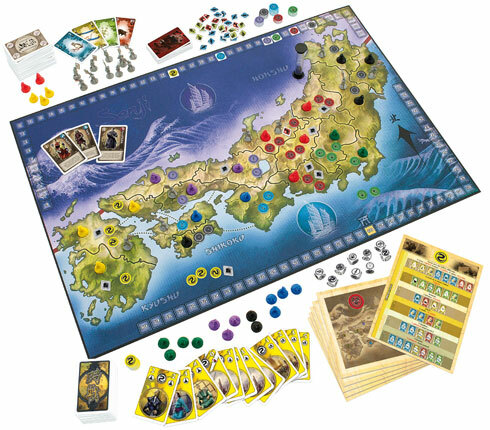 At the end of the turn, players then place any units that were purchased at the beginning of the turn and collect IPCs based on all territories that they control at the end of their turn. 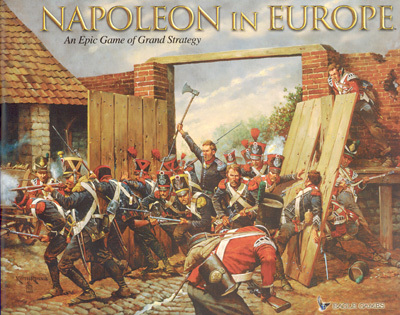 Players take the role of a Napoleonic-era power and move miniature plastic infantry, cavalry and artillery to simulate the campaigns of Napoleon. 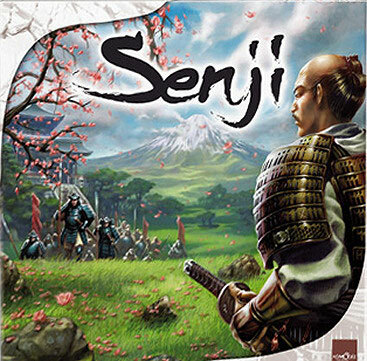 The fascination of this period is well established, and playing one of these games might seem like a wonderful way to recreate the epic battles and campaigns of the time. 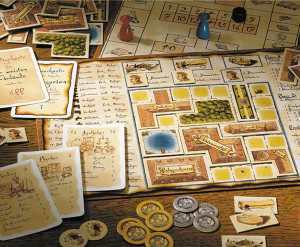 However most such games use cardboard counters or other simple devices to represent armies, and for many this simply is not satisfying. 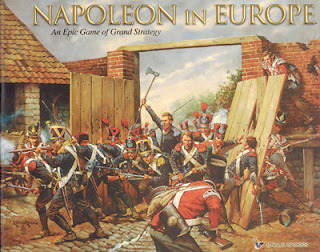 'Napoleon in Europe' from Eagle games does not pretend to reproduce the glittering scenes of the time, but it goes further than most by providing large numbers of playing pieces to mark infantry, cavalry and artillery, and joy of joys, they are 1/72 scale figures. Therefore whether you actually play the game or not any Napoleonic miniatures fan will need to know something of what this game supplies. 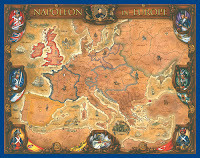 The game includes an impressive 564 miniatures as well as a number of counters and a very large and attractive map of Europe as a game board. All the miniatures are in the industry-standard soft plastic and average around 24mm in height, so are entirely compatible with the sets of figures we have reviewed elsewhere on this site. Several difficulty levels and scenarios included in the box. Standard game has a map that offers a grand strategic view of the action, and separate board for battles to reflect tactical realities of the period such as combined arms, infantry square formations, and reserves. Standard game also includes diplomacy, fleets, and economic system. There are seven major nations to play as: France, Great Britain, Russia, Austria, Prussia, Spain, and the Ottoman Empire. When games are played, most of the time each country is given (in relative terms) the amount of troops it had historically. So France and Russia vastly outnumber the forces of second-stringer powers like the Ottomans. Game play is similar to Risk, at least at the very bare bones. Each player has their own designated turn where they move, and then fight any combats that result from it. But there, the similarities end. Rather than randomly roll huge fistfuls of dice as Risk players do, fighting troops are transferred over to another, smaller board that simulates a battlefield, allowing for the game to be played on both a tactical and strategic level. Noteworthy to mention are Political Action Points (PAPs). Unlike in other strategy games where one can randomly declare alliances and war, PAPs are a system that prevents such a thing from happening so easily. It costs one to do things like establish alliances, declare war, sue for peace, or even something as simple as annexing new territories into your empire. It also makes it harder for one to backstab an ally or declare war randomly, making for more historically accurate game play.